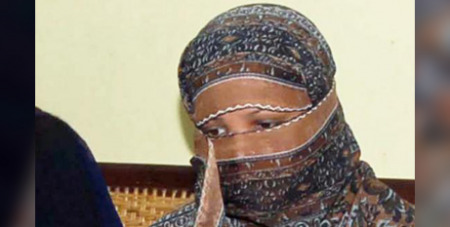 Asia Bibi, a Catholic woman acquitted of blasphemy after spending eight years on death row in Pakistan, is still unable to leave the country to join her daughters in Canada. Source: The Australian. Aman Ullah, who spoke to Ms Bibi by telephone on Friday, said his friend was being held in a room in the southern port city of Karachi. He said the 54-year-old, who faces death threats by radical Islamists, is frustrated and frightened, uncertain of when she will be able to leave Pakistan. “She has no indication of when she will leave ... they are not telling her why she cannot leave,” said Mr Ullah, who fled the country on Friday after receiving threats from extremists angered by his assistance to Ms Bibi, which began while she was on death row. Mr Ullah has liaised between Ms Bibi and European diplomats, who have sought to assist her since her October acquittal, which was upheld last month. Ms Bibi’s ordeal began in 2009 when two fellow farmworkers refused to drink from the same container as a Christian woman. There was a quarrel and the two Muslim women later accused Ms Bibi of blasphemy. The Supreme Court judges said there were widespread inconsistencies in the testimony against Ms Bibi, who has steadfastly maintained her innocence. The acquittal should have given Ms Bibi her freedom, but Mr Ullah said diplomats were told her departure from Pakistan, where she feels her life would be in danger, would come not in the short term, but “in the medium term”. He said Ms Bibi told him she was locked in one room of a house. “The door opens at food time only,” said Mr Ullah, and she is allowed to make phone calls in the morning and again at night. He said she usually called her daughters. Ms Bibi’s husband was with her, he said. “She is living with her family and given requisite security for safety,” Information Minister Fawad Chaudhry said. He said the government was responsible for taking “all possible measures” to protect her and her family, adding that “she is a free citizen after her release from jail and can move anywhere in Pakistan or abroad”.